I seem to be talking quite a bit about breakfast lately...especially the make-ahead-grab-and-go kind of breakfasts. However, truth be known, all the menfolk in our household quite enjoy breakfast for dinner, thus elevating budget-friendly breakfast recipes to reasonable meals for other times of day as well. What makes these burritos worthwhile? 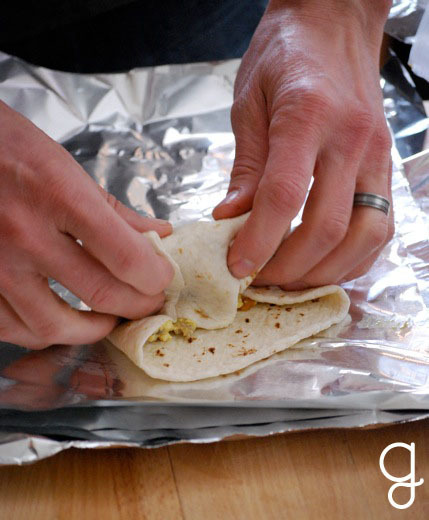 You can make them ahead, freeze them, then warm them up in microwave or out on the grill for a crisp tortilla. And as eggs, cheese, potatoes, and tortillas can all be purchased in bulk, a breakfast burrito finds its rightful place at the Frugal Table. If you are going to make hashbrowns for the burritos, first wash potatoes, and bring (unpeeled) to a boil for 15 minutes in a large stockpot. (Blanching the potatoes will keep them from turning black when frozen.) When cooled, peel potatoes, and shred. In large nonstick pan, melt several tablespoons butter, and cook the shredded potatoes until golden brown, seasoning with salt and pepper to taste. Transfer to a large bowl. In the same nonstick pan, cook up sausage; drain fat from pan. (If using bacon, cook bacon as you would usually, and crumble.) Set aside breakfast meat, and in the same pan, heat a few tablespoons oil, and cook up beaten eggs and cream until scrambled. Add meat back in and combine. Remove from heat and transfer to another large bowl. Add in shredded cheese to taste. I say, the cheesier the better! Add the salsa now if you'd like (I do, to save time), or add it individually to burritos. 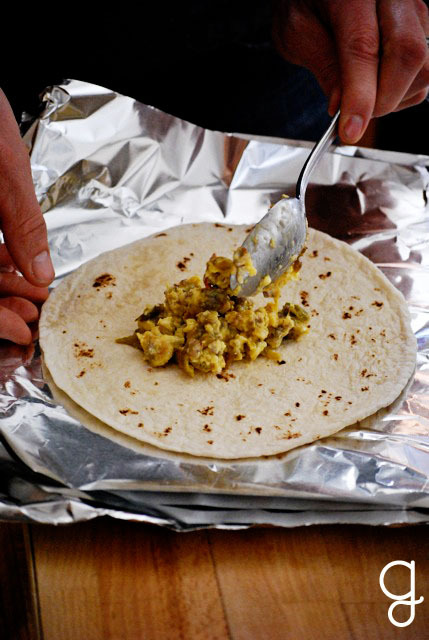 To make burritos, tear sheets of foil large enough to completely wrap a burrito. I have a stack of foil ready to do an assembly-line. 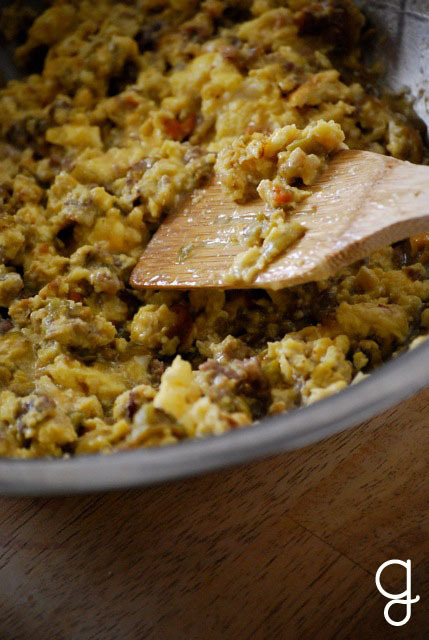 Place a heaping tablespoon or two of hashbrowns and egg mixture in the center of tortilla. Add in salsa if you haven't already. 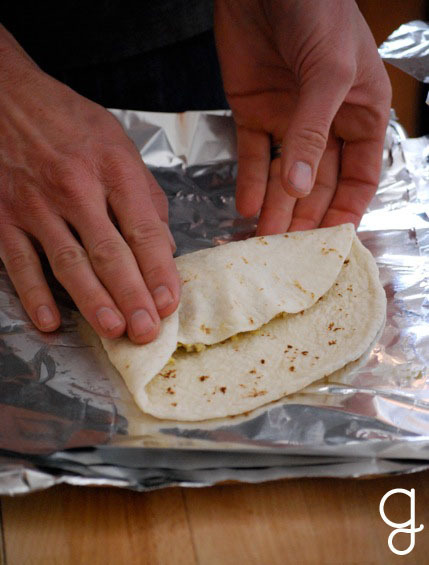 Fold in both sides of tortilla, and roll. 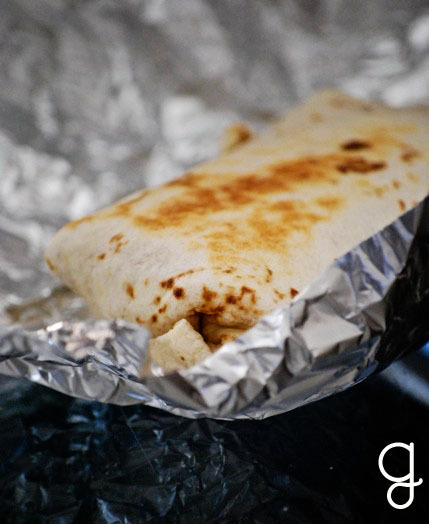 Wrap burrito tightly in foil. Cool and refrigerate or freeze in freezer bag. Did I mention that this is fantastic for camping trips? On the high side, you're looking at breakfast burritos for about $.50 a piece! And, as usual...I highly recommend experimenting with other fun additions: beans, sauteed onions, bell peppers, green chile, red chile...just to name a few!